Artist Huang Rui standing in front of Shadow at Comerchina exhibition at 10 Chancery Gallery. Father of contemporary Chinese art, Huang Rui is a Beijing artist who dares to think and act differently in a society that demands conformity. Prominent founder of the historically momentous 1979 Stars Group as well as the famous Beijing 798 Factory, Huang Rui showcases his exhibition Comerchina at 10 Chancery Lane Gallery (17 Sep – 10 Oct 2009) in Hong Kong. Characteristic of his previous work such as “拆那(demolition)/China”, this series of new paintings called “Hall of Fame” is a collage that tweaks a pun on advertising imagery contributed by online participants. In an exclusive interview with Art Radar, Huang Rui explains the layers of political and economic connotations in Comerchina, the difficulties facing art in this consumer society and the impossibility of escaping political scrutiny. Q: Why is the exhibition called Comerchina? The theme is related to commercialization and China. Ever since the 1990’s, China has become more and more commercialized in three aspects. First, politics is becoming a servant of commerce. Second, commerce is labeled with cultural slogans. Third, the entire structure of society is changing and, as an integrated society, is very dangerous. It’s different from a global society, which is only an element of an integrated society. It’s not a dictatorship, but rather a particular organizational system. Politics, the demand for a rise in economic standards and personal interests means that other important concerns such as art are being sacrificed. We need to reflect, criticize, and protest. Q: How do your new paintings and installations in this show speak to over-commercialization and the power of money in China? What do the numbers represent? If someone attacks you, you attack him as well. It’s a natural response. In my work, the number represents you and me, since everyone uses cell phones. In the work of a 100-yuan bill with Mao, there are 100 numbers. 100 out of 100 represents an integrated society. “Made in China” refers to the global economy and the power of cooperation. Q: How do you see contemporary art in China evolving? Where is it going (the trends)? Would you consider yourself a trend leader? It’s getting more commercialized, there is more variety and commerce is a factor that makes cooperation indispensable. Chinese society in the South including Hong Kong, Shanghai, and Shenzhen are producing imitation art. Hong Kong is focused on business, so real art is hard to develop. Artists in Hong Kong either have to bear with it or move out. It’s not up to the individual artists to enforce change. Our power is confined to criticizing and perhaps creating new structures or models, new thinking, and making proposals. To lead changes in the art world, it is up to the social elites, the politicians, and the urban planners. Q: In your work Shadow, the characters taken together mean “maintain dictatorship of the proletariat”**. Would this work be permitted in mainland China? Many of my works were not just banned in China, but also elsewhere such as Japan, where I used to live. In 2005, there was a 3D Asian Art Fair in Korea and Singapore, but the Consulate General of China protested against the exhibition of my work. **note: In the Commerchina book that Huang Rui gave me, there are pages of quotations by Mao categorized respectively under upholding, proletariat, classes, and dictatorship. Q: Tell us about your activity as an artist against political force. I participated in the Wall of Democratic Rule (1978-1981) in Beijing. With Deng Xiao Ping’s permission, people could voice their opinions, until Deng Xiao Ping withdrew the democratic wall in 1980. I also participated in an underground magazine about arts and literature. In 1979, I founded the Stars Group of 1979 along with other members. Just search on the web and you’ll easily unearth a lot of information about the group. For a revealing insight into contemporary art and its relationship with political and gender issues in Iran today, don’t miss this intriguing interview with Parastou Forouhar in which she describes how she challenges viewers to take a second look. Parastou Forouhar, from Series II, Tausend und ein Tag, 2009. Art by Iranian artist Parastou Forouhar takes on political proportions with her intriguing delicate imagery of torturous acts being perpetrated by Iran’s authoritarian regime. Political violence is a deeply personal issue for the activist artist, whose parents were the victims of a politically motivated murder in Iran. In an interview with DB Art Magazine, she discusses this trauma and her artistic style of creating beautiful ornamental artworks, which upon closer inspection reveal twisted scenes of cruelty. I challenge the viewer to take a second look. At first glance, you see the beautiful pattern and think you’ve understood it. And then you get a little closer and realize, no, it’s completely different, I didn’t understand anything at all. To challenge the viewer to take a second look is exciting to me. The viewer is thrown back on himself and is forced to reevaluate his perception. This compelling interview also covers whether Islamic art is becoming ‘more Catholic’, (and yes, she agrees it is leaning more towards visual Islamic-pop elements and ritual), and questions the attitude of the young male Iranian generation towards their patriarchal past (they are reportedly ‘fed up’ with the traditional masculine character.) Read full interview here. Take a walk down a public Hong Kong street these days and you might find yourself bumping into some portable – and surprisingly intimate – art. While Hong Kong artist Tim Li’s private bed has been erected all over Hong Kong from Pedestrian Street in Mong Kok to the center of Times Square, last month the Gao Brothers from the mainland brought their special brand of peace-promoting intimate performance art into the hustle and bustle of the city. Bring on the hugging! Gao Zhen and Gao Qiang, a pair of prominent artists born in Jinan and based in the Beijing 798 Art Zone were invited by Para/Site Art Space to spread an hour of love and hugs outside the Hong Kong Arts Centre on July 29 2009. The Gao Brothers share with Wendy Ma how their ideals are reflected in their installation, performance, sculpture, photography works and writing, and how these beliefs were shaped by their unusual experiences. 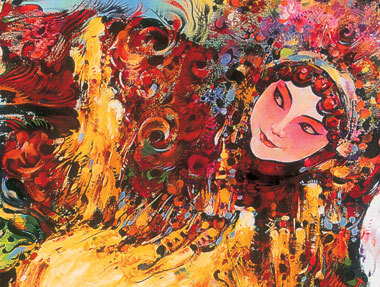 Q: What inspired you to create artwork such as Miss Mao, etc.? Did it create any controversy in China at the time? Miss Mao by Gao Brothers. Painted fiberglass. 85 x 55 x 59 in. Miss Mao is mainly inspired by Chinese people’s “mao” bing (毛病*), ignorance, and immaturity. 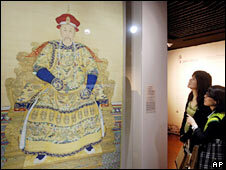 The artwork is only permitted to be displayed in overseas galleries and museums, it still forbidden in mainland China. We can only find information regarding the exhibition of this artwork on the internet. The reactions from the audience are a mix of praises and criticism. *Note: Mao bing means “problem” or “syndrome”. In Chinese it is the same “mao” in “Mao Zedong”. Q: What inspired you to initiate the World Hug Day*? Utopia of Hugging for 20 minutes. Performance by Gao Brothers in 2000.. There are too many conflicts in this world. The hatred and blood-shedding tensions among humans, among ethnicities, among nations have never ceased. In 2000 we believed that the human civilization should enter a millennium of compromises. So we began to promote the act of hugging among strangers. At that time we were forbidden to leave China, which left us unable to promote hugging overseas. By proposing the “World Hugging Day” on the internet, we earned corresponding support from various parts of the world. Among the advocates there were non-artists, artists, as well as the organizer of the Venice Biennale, Harald Szeemann. *Note: “Gao Brothers carried out their first group hug performance, “The Utopia Of Hugging For Twenty Minutes” on September 10, 2000 by inviting one hundred and fifty volunteers, who were previously strangers to each other, to take part in the event. They asked all participants to choose a person at random for a hug of fifteen minutes duration. Afterwards, all participants huddled together for an additional five minutes. Since 2000, Gao Brothers have hugged hundreds of strangers and organised group hugging performances with strangers at many public locations in different ways and have taken a lot of interesting photographs. Q: In your view what is the most meaningful artwork you’ve created? Why? In our eyes, our artworks are all different and irreplaceable. It’s difficult to decide which one carries the most meaning. Q: How long have you been involved in art and how has your art evolved over time? We have been working for 20 years. Regarding the transformation of our artwork, there’s a lot of articles written by art critics, but it’s hard for us to say. Q: Were your parents supportive of your decision to pursue art as a career? Would you encourage your children (if you have any) to pursue art? Did you think you would become this successful? My father passed away a long time ago during the Cultural Revolution. My mother was skillful at paper-cutting but she became ill and died in 1999. She gave us plenty of support for creating art. Our children are interested in art, too, so we definitely support their decision to pursue their interests. Initially we became involved in art purely from the heart and never considered whether or not we would succeed. Even now we don’t consider ourselves too successful. Q: Any obstacles in your art career? Too many unforgettable obstacles. The most memorable took place in 1989 during which we participated in the Contemporary Chinese Art Exposition in Beijing. By coincidence we took part in the “Pub Petition Incident” in which the intellectual circle demanded that the government release the political criminal Wei Jing Sheng*. After Wei Jing Sheng was released from the prison and before his second imprisonment, we paid him a visit. As matter of a fact, we weren’t acquainted with Wei Jing Sheng. He simply wanted to invite us to participate in the China-Japan-Korea Contemporary Art Show organized by him and Huang Rui. However, due to the petition and the correspondence with Wei, we were placed on the government’s infamous black list as “national criminals”. For ten years we couldn’t obtain our visa, which had a profound impact on our participation in international art activities. In 2001, the organizer of the 49th Venice Biennale, Harald Szeemann invited us to the Opening Ceremony to demonstrate our “hugging”. Unfortunately we failed to obtain a visa. We were even prepared to smuggle ourselves out but eventually we decided not to go. It wasn’t until 2003 when we were invited to attend the Second Rome International Photography Festival that we were taken off the black list and given the visa. Q: What message do you want to convey through your art? Liberty, peace and compromises, human love, and many more related yet ineffable messages. Q: What are the characteristics of your artwork? Q: You’ve done so many “world hugging” events in various cities (which ones?). Which have made the biggest impression on you and why? What did you think of the one in Hong Kong? Final round of embrace on a hot July day in Hong Kong. Gao (in black) giving a participant an enthusiastic hug. Ever since 2000, we have been “hugging” in Jinan, Beijing, London, Nottingham, Marseilles, Arles, Berlin, Tokyo, and many more cities. Each “hugging” left a deep impression on us. Despite the fact that the fewest number of people showed up for “hugging” in Hong Kong, it was still memorable. The number of attendees at the hugging event carries more or less some sort of implications. Actually, we don’t really think it’s that Hong Kong doesn’t embrace hugging. It was so scorching hot that having some hugging enthusiasts was enough to move us deeply. Q: You just went to Macau today. Was it for the “world hugging” event again? What are the differences between their attitudes and Hong Kong people’s? Gao Brothers' demonstration of hugging outside the Hong Kong Arts Center, late-July 2009. We were invited by Para/Site to do the hugging in Hong Kong. Macau didn’t invite us. We only went as tourists and didn’t make any hugging plan. Q: Your next stop is Israel. What do you expect? Last year we already received the “hugging” invitation from Israel. It would be nice to have an Israeli and a Palestinian hug each other. Q: Have there been any changes in mainland contemporary art? How is the freedom of expression? Have you encountered any difficulties or objections? Every artist is different. We’ve always been busy with our own work, so we haven’t paid sufficient attention to other artists. With a lack of comprehensive understanding, it’s difficult to say about the changes in mainland Chinese contemporary art. To us, it’s not bad, even though the art examination regulations in China do not permit public exhibition of certain pieces of our artwork. Q: Can you perceive any differences between Hong Kong and mainland contemporary art? We don’t have an adequate understanding of contemporary Hong Kong art to discuss it. Q: Which other artists inspire you? Are there not enough ridiculous, not enough stimulating events happening in the world every day? Why would we need to excavate inspiration from the salt of other artists? Q: Among photography, sculptures, and performance art, which one do you prefer? About the same. A bit bored with all of them. Q: What would you like to do next artistically? Film. We’re in the process of revising a script to make a film. Gao (in white) hugging a participant outside the Hong Kong Arts Center in late July, 2009. Q: Why did you invite the Gao Brothers to do this performance (hugging)? I wanted to test the use of public space in Hong Kong. The Gao Brothers performance is very much connected to the Chinese physique, but also the public dimension of it is quite fundamental to this work of art. In practice, the project has proved how many burdens and restrictions exist in preparing this type of event that engages the public sphere in Hong Kong. Q: What did you think of the performance? The performance has a degree of improvisation that I love. 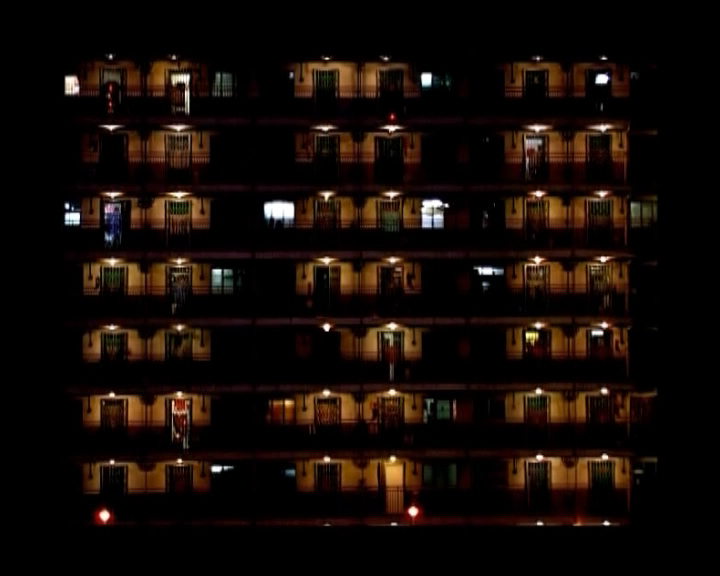 As it adapts to each new situation, it is quite fluid and dynamic, and it blends and connects with the social, cultural and political framework of the location in which it takes place. 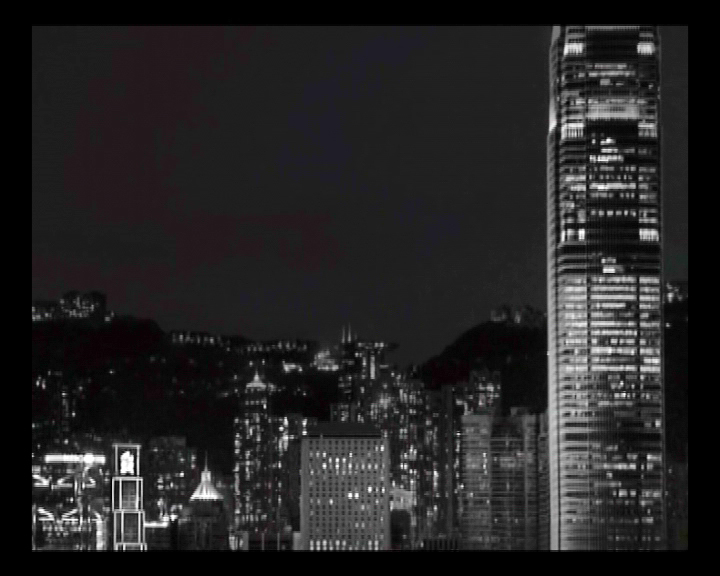 This time it was specifically connected to Hong Kong. With the greater involvement of the artists in the performance, this probably highlighted some relational issues, as it took a turn more towards the sculptural and the theatrical. Q: How is it similar or different from other artists’ performance or exhibitions? Every time they stage this performance it has a different meaning and a different result. I find this work meaningful in relation to the other works, but on a superficial level it might seem unrelated to their work, specifically their sculpture, painting and photography. However the notion of the outer boundaries of the body and its political inferences are themes that run through their art practice. I only wish more people in Hong Kong had participated in the hug day. I was watching from the side at the start, and people came up to me to ask “what is going on?” They were genuinely curious and when I explained it to them, they were very interested and supportive. Later, I did actually get involved and hugged the two artists and others there. While I admittedly felt awkward at first, I appreciate the powerful symbolism of this act amongst strangers. I am now a huge fan of their work – beyond the world hug days, too, and look forward to seeing what they do next.